3DS XL is just eight days away — at the time of writing — in Europe, so it goes without saying that we can all look forward to plenty of accessories and extras flooding stores and online retailers. We've received an initial shot across our bows today from Snakebyte, a company that provides plenty of low cost cases, adapters and so on for various gadgets. Details are in the press release below, and we imagine that a quick browse of any online retailer in the coming weeks will show a lot of different options to buy. The Nintendo 3DS XL release is right around the corner and the accessory specialists at snakebyte [have] got the perfect accessories ready to go. Especially the fact that the Nintendo 3DS XL handheld will be sold without a charger in Europe and Japan means that potential buyers are on their own when it comes to getting a charger. This is where snakebyte comes in with their universal:ac adapter, the perfect charging solution just in time for the release. The universal:ac not only supplies power to the 3DS XL, but is also able to charge 3DS, DSi XL, DSi, DS Lite, DS und GBA SP. The universal:ac will be available right in time for the release of the 3DS XL for SRP 7,99€. 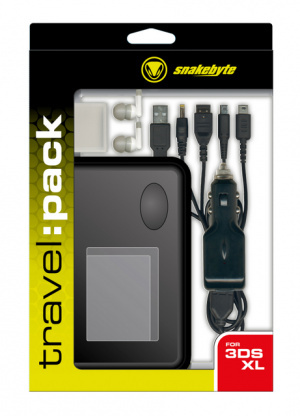 In addition to the charger, snakebyte now also offers their popular travel:pack for the 3DS XL. The affordable kit consists of a USB charging cable that can charge up to 7 devices, a car charger, three game cases, two screen protectors as well as a sturdy carrying case and in-ear headphones. The travel:pack is also available just in time for the release of the 3DS XL for SRP 19,99€. To round off a great offer, the screen:protect (SRP 4,99€) as well as the travel:bag (SRP 9,99€) may be purchased separately.“We are thrilled to be able to offer our high quality snakebyte accessories to gamers just in time for the release of the 3DS XL. The missing charger may be an unpleasant surprise for some customers, but that gives us the opportunity to offer our charger, especially to newbies”, Mike Steup, Managing Director of Sunflex Europe GmbH commented on the announcement. These look good. I always find accessories very interesting. Sounds about that the only actually new product here would be the travel case? Otherwise everything else is completely compatible with the existing 3DS, the charge cables are all the same. @RupeeClock Don't forget screen protectors that actually fit! All i desire for is a soft leather-ish flip 'n play for my 3DS XL. Sorry Snakebyte but we get chargers with our 3DS XL's in Australia. Still, I will need a case and set of screen protectors. Yeah the case & the screen protectors are basically what I'm gonna get for the 3DS XL too. Though that car charger does look handy for long trips. I have bought lots of accessories for my 3DS and I'm probably getting something nice for my 3DS XL. I need to find the perfect case to store and protect it wherever I go. Not sure I'll get any of these though. Do the 3DSXLs in the states get chargers? @Wilford111 Yes. They come with the chargers included. I can't wait for the Nintendo 3DS XL accessories in America! I'll rather just buy a Zelda case, screen protectors, and use the ac adapter from my 3ds. Not that much of a fan of accessories. That travel pack looks quite good,but I want a case like my original 3DS.